I am an avid fan of watching Discovery Channel, History Channel, NatGeo, and any other program that triggers my fascination to science and history. There were several times that the history of the events of the Atomic Bombs that fell in Hiroshima and Nagasaki were shown as a documentary in any of the programs of the said channels. The development of the Atomic bombs was hidden under the code name “Manhattan Project” that started in 1942 and both bombs were dropped in 1945 in Hiroshima and Nagasaki. 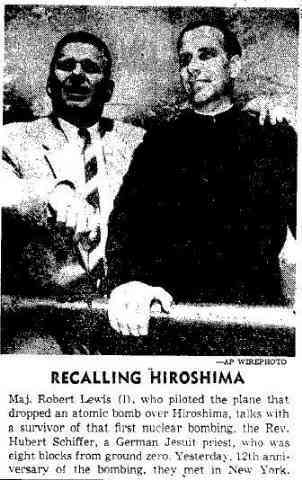 The Atomic bombs were named “Little Boy” and “Fat Man”. In August 6, 1945, Little Boy was dropped over the City of Hiroshima and killed to an estimated high of 166, 000 and death toll climbed further after due to radiation, illness, and infection. The same was true with Fat Man that was dropped in Nagasaki in August 9, 1945 killing an estimated 80,000 people with the same effects as that of Hiroshima days after it was dropped. Over two-thirds of both cities were destroyed. However, in such documentaries, there is no mention of the Jesuit priests who somehow survived the blast. Their presbytery was less than a mile from the blast point of Little Boy. 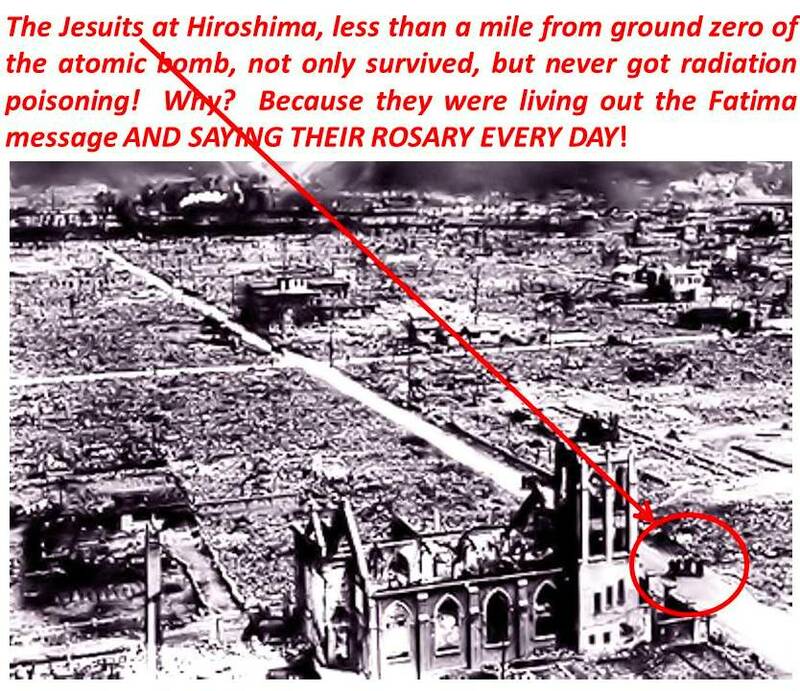 Such closeness will be impossible for anyone to survive the blast and structures to be still standing, but on that fateful day, these eight Jesuits were an exemption. They have survived unscathed and their presbytery remained standing while every structure around them were flattened to the ground. Fr. Hubert Schiffer, a German Jesuit was one among the eight who survived the blast. He was only 30 years old at that time but was able to live until the age of 63. That’s 33 years after the blast. Scientists who heard of this immediately started to find out why they, among all, were able to survive and somehow were not affected by the radiation considering the nearness of the blast. Experiments and observations were done to each of them and this went on consistently through the years but to surprise the scientific world, no scientific explanation can be drawn from this mystery and every scientist always failed to draw a factual conclusion. Just as Atheists are now trying to deny the existence of a great God and saying that the virgin birth of Jesus as well as his resurrection are all but myths, the story of this eight significant Jesuits are now also being forgotten until it will come to a point that someone will once again come forward and say that this event really never happened and were all made up. It is our duty to continue to manifest the miracles that God makes to his people and those who are faithful to Him. We must always stand firm and collect as much evidence to maintain the truth that our Faith is genuine for their will come a time a fool will influence the world that such miracles never happened. Fr. Zlatko Sudac (pronounced “Sue-dots”) was born on January 24, 1971. He is from the town of Vrbnik, on Krk island, in Croatia. He began studying for the priesthood in 1993, after completing his mandatory military service in the Yugoslav army. He was ordained a priest on June 29, 1998 and is a diocesan priest for the diocese of Krk, Croatia. Both of his parents are still alive. He has one sister, who is married and has 2 children. Fr. 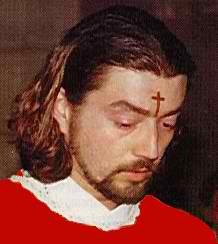 Sudac received the cross on his forehead in May 1999, on the Friday after the beatification of Padre Pio. After he received the cross, he was sent to the Gemelli Clinic in Rome to be investigated. The exhaustive investigation concluded that Fr. Sudac’s cross was not of human origin, i.e. that it was formed in a way that medical science could not explain. Fr. Sudac received the stigmata on his wrists, feet and side on October 4, 2000, the feast day of St. Francis of Assisi, who was the first person in the history of the Church to receive the stigmata. Fr. Sudac currently works at the Bethany Retreat Center, which is located in the tiny village called Cunski (pronounced “Choon-skee”), on the island of Mali Losinj (pronounced “Molly Lawsheen”). This island is located in the northern Adriatic, just south of the port city of Rijeka, Croatia. This island was once part of the island Cres. In Roman times the two islands were separated at the isthmus city of Osor when a canal was dug. North and east of Losinj and Cres is the island of Krk, which gives its name to the local diocese. Mali Losinj has a population of about 6500. It dates back to at least the 12th century when about a dozen Croatian families went there from Hungary, taking refuge from the attacking Mongols. Today, Losinj is a very popular tourist site due to its beautiful island scenery, the pristine Adriatic sea, and its beautiful beaches. Fr. Sudac’s primary messages are very simple ones: that love has to be the foundation of everything that we do, and if we live in love, then we live in God; that we must be open to the gifts of the Holy Spirit and the work of the Holy Spirit in our lives so that we can live the fullness of what God wants to give us; that we must die to ourselves completely so that God can fill us with Himself; that we must be completely normal people, who have our feet firmly planted on the ground, but ever aware that while we live in this world, we are not of it. This is just some of what Fr. Sudac’s primary messages are. Fr. 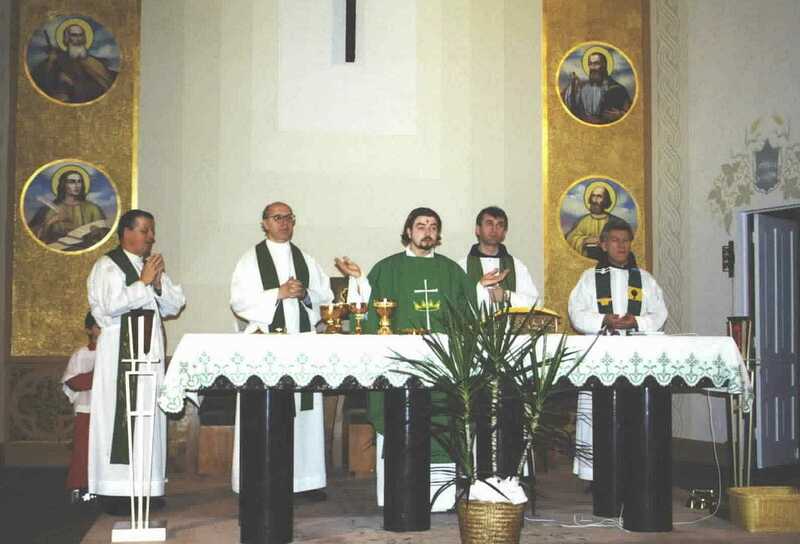 Sudac twice visited St. Jerome Parish (October 1999; January and February, 2001) What follows is his message in his own words. Q: Why did you decide to become a priest? For many years I thought about the way in which to actualize myself to the fullest as a person. I finished high school for mechanical engineering. Then I started to study philosophy and psychology. I decided to switch to the theological seminary to become a candidate for the priesthood for my diocese. To speak about my life’s call means to dive a little deeper into my being, into my heart. Every person asks himself which is the way to most fully actualize himself. In the same way I thought about how I could surrender myself completely. Spirituality always excited me. I always read spiritual books. Then I simply decided and it was the final step towards trust in God. I saw that work with people, with the sick, with the marginalized makes me happy, and that if I live in that way, I would never be alone. The one who lives for people receives a great deal from people. These are the things of value which are eternal. One of the main reasons for our existence on earth is to be people who love and who live for other people. Today, this is very necessary. I am young. In front of me is life and my future, and I pray to God for the grace to have a heart for every human being, especially for those who are far away – far away from other people, from God, and from themselves. Q: Did you grow up with Catholic parents? Were they allowed to practice their faith and did the communist idea of no God affect you? How did you come to know God under communism? My family is a traditional Catholic family. And precisely that tradition is for many people a barrier to the experience of living. I would come to church comforting myself that I knew and loved God. Then I understood that that was not love but a habit. Then I asked myself if I would want to be a person who was loved (by others) out of habit. How does God feel when we love Him out of habit? Then I understood that love for God is something that is alive and original, something so deeply rooted in the depths of our being, something which changes our life, and which gives us the power to bear witness to other people. To love God in the present moment. To be alive now, not tomorrow or in the past. To live every step with God. It means to be God’s messenger. That is something which has always awakened within me a certain adventure for God. God is the Father of all people who wish to proclaim Jesus Christ. One needs to have a great depth of spirit to live for everyone, because God died for everyone. Q: How old were you when you went to the priesthood? 22 years old. Q: How old were he when you were ordained? 27 years old. That was a year ago on June 29, 1998, on the feast of St. Peter and Paul . Q: Are you part of the Charismatic Movement? At the Second Vatican Council, our Church defined the Church as being institutional and charismatic. The problem is that many charismatics live outside the institutional church. We live in a time when our union with our bishops and the pope will be the only guarantee of true and correct actions of both priests and the laity. If God gave me a specific mission, then I don’t have to be concerned about that mission. If God desires it, then He will do it through the Church and the Church’s leaders – He will make it possible that I live my charism for the good of the Church and all peoples. I am just one piece in the mosaic. And it would be better for me not to have been born if I were to draw attention to myself and not to Jesus Christ. Truly this is the only true way to serve God in the next millenium. Q: You were in the seminary for 4 or 5 years? Six years Q: How many brothers and sisters do you have? I have one sister. She is married and has 2 children. The Stigmata Q: What kind of prayer meeting were you leading when God gave you the Stigmata? That is how the newspapers wrote it. But in fact it wasn’t a prayer meeting. It was a friendly get-together in one family’s home. When I speak about all of those events which took place then, I speak with a tremendous fear of the Lord because I myself experienced how it all surpasses my very self. Many people have asked me what I think of all of this, and I tell them that they want to know something which I myself do not know. Jesus Christ said that by their fruits you will recognize them. If people come to my Masses and seminars and experience God there and change their lives, if many sick people are healed, if those in conflict with one another reconcile, if people throw out all of their filth before God and seek peace with God, if those in sorrow find hope returning, then that is the fruit to which we have to turn our attention, and not myself (i.e. do not turn your attention to me). I constantly announce at the seminars that if you have come there because of me, then you have made a mistake, but if you came because of Jesus Christ then stay. We must look at the giver, not the gift. I experience myself as sandals which God puts on and which he will tread upon so that through them (the sandals) He may come to those people whom He intends to reach. May God give me the strength so that with my life I may faithfully serve Him, to His honor. Q: Do you have pain in your forehead? It doesn’t hurt me, except when I am in prayer, and then I feel it pulsing. On first Fridays and at certain times, it’s known to bleed and leak as though it is crying. Q: Are you an Order priest? No, I belong to the diocese of Krk, in Croatia. The Blessed Mother Q: Are you close to the Blessed Mother? Very much. She is my beloved mother. All evil forces fall before her. One can pray to her only with a pure heart, and I will be grateful for her protection until the end of my life. Personally I have consecrated myself to the Immaculate Heart of Mary. The mother is truly the gentler side of our spirituality. In this technical and rough society, we are missing the mother of gentleness. Q: Did you dedicate yourself to Mary as a child? A year ago. Q: Were you close to Mary as a little boy? There is an interesting story about my mother. When she was a young girl, she wanted to be a nun with the Missionaries of Charity. But at that time, it was required that the family give a certain amount of money so that the girl could join the convent. My grandmother, that is, the mother of my mother, was very poor, and she was not able to do it. That is when my mother vowed to Mary, our heavenly Mother, that if she was not able to do it (i.e. become a nun), if God gave her a son, she would consecrate him to God. My mother acknowledged this to me only at the point when I told her that I wanted to be a priest. I never knew anything about this vow of hers. At that time, through tears, she told me about this vow she made. Through this I can see that the intercession of the Mother of God protected me. Q: Is your father alive and where do they live? Yes, they live on the island, Krk, the same place from which the archbishop of Zagreb comes. My mother went to school with the archbishop of Zagreb. In my diocese there are about 70 priests. It is one of the smallest dioceses in all of Croatia. Q: Have you been to Medjugorje? Three times. Those were unforgettable experiences. It is a holy place of prayer, silence and conversion of heart. Q: Were you a priest when you first went to Medjugorje? I was very young, a young boy the first time. Q: Have you been there since you became a priest? Yes. Q: What is the most important thing you found in Medjugorje? Honesty. To be a lover of truth. Today truth provokes. It seeks the whole person. And Mary cannot but to ask for my entire self. Giving myself to Mary and to God, I do not lose myself, but I find myself. That is what I carry from Medjugorje. The message I received – especially have trust in God. No, I have never had a vision or an apparition, but I have a conversation of the heart. It is a gift of being able to diagnose or read people’s hearts. That gift is manifested with me when I am in spiritual conversations or hearing confessions. It is always given as a help to the person so that he can express himself and fall in love with God. Before the phenomenon of stigmatization, I had gifts like the gift of tongues, the gift of healing, the gift of counsel, and slowly the gift of knowledge came also. After the stigmatization, I received many other gifts. Some of these gifts overwhelmed me very much. And so I needed some time to get accustomed to what was happening. By this I refer specifically to the gifts of levitation, bilocation, illumination, and the knowledge of upcoming events – the knowledge about the near future, especially about future dangers. I would like to wait until a certain time passes. I am in cooperation with some experts – the top experts in the world. I would like the whole thing, from their side to be well observed. And until the official Church makes an announcement regarding these certain phenomenon, in my heart I am not sure whether it is good to speak about these things. I want to draw attention to Jesus Christ, and I am afraid that with these things, I may be drawing attention to myself. I am a sinful man. Since the stigmatization, I have a tremendous need for the Sacrament of Confession. For me it is the same as for everyone else to walk this earth, to be little and in that way I will belong to God. No, the gift of tongues have two or three groupings. One is that a person has never studied a known language but is able to speak that language. The second is that a person can speak old forgotten Hebrew, Aramaic or other old Semitic languages. And the third gift is the so-called babbling – when a person through the grace of God can speak the so-called angelic language. This gift is mentioned in Holy Scripture. We have to be very careful with this gift because evil spirits can also use this gift of tongues. Once there was a séance where people were praying in tongues, and these gifts of tongues were tape-recorded. A person who had the gift of understanding tongues, understood that those were all cursing, blasphemies and profane language against God. At Pentecost when the apostles spoke in various tongues, then one spoke and everyone understood. With us at our prayer meetings, it so often happens that everyone speaks (in tongues) and no one understands. My experience is this – the one who has the gift of tongues and feels purity in their heart and the need to praise God with this (gift), he should begin to pray out loud. But if in that moment, a person with the gift of understanding tongues does not come forward, then that gift, in that moment is not given for the building up of the community, but for the individual building up of that person. Then I recommend that that person pray quietly to himself. Every gift which we have is not given for the individual person but for others, for the community. I am at the service of the will of God. It’s a very interesting gift, which is manifested only at the point when other people bear witness to it. The person (with this gift) up until the last moment is not certain what is happening with him. You have the feeling that you are at one place, but your heart and imagination wants to be somewhere else. This happens when the person is forbidden from being with God, with prayer, with the Blessed Sacrament. After a similar prohibition which I experienced, the bilocation manifested itself. I was with God at one place and the other, but the other place I experienced more in my heart and imagination than in my body. It’s interesting that I knew everything that was happening there. I would have ascribed this all to my imagination had some people not come forward and confirmed it all – six people who saw me physically there. With one of these people I even shook hands. I still feel it very much. God is something which surpasses any and all thoughts about Him. He surpasses our feelings, and even the state of our souls. It is impossible to speak about Him. The only way to communicate with God is to love God. We have to sink into God so that I no longer exist but God does. When I do this I don’t lose myself, but find myself in God. This can be understood only by those people who love God with all their heart, all their soul, and all their strength. If anyone sins, the only cause for all sins is the lack of love towards God and the lack of love for mankind and ourselves, that is the cause of all evils. If this wounded humanity would discover the formula of love, unconditional love, this life would be heaven on earth.